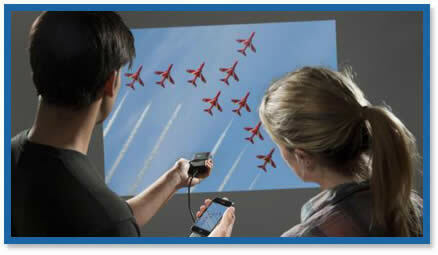 With only 5”long it can project images of up to 50” anywhere. In November, 2008 they introduced the first model, the 3M MPro110, and six month ago they updated it, with the 3M MPro 120. 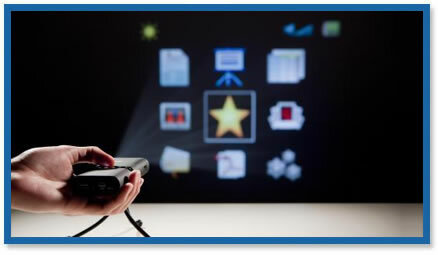 But the technology keeps moving forward, and today 3M makes official the third generation of their micro-projector, named 3M MPro150. The new model is mainly differentiated from its predecessor by going from 12 to 15 lumens and incorporating an internal memory of 1GB. Besides, it incorporates a micro SD slot, that we can use to extend the capacity (a 2GB card is also included). It also surprises the way in which autonomy is reduced to half, regarding to MPro 120, only 2 hours versus the 4 hours of the previous model. The design is slightly renewed and it offers compatibility with the most common files used for displays, such as the computerization suite of Microsoft Office (Word, Power Point or Excel) PDF, JPG, BMP, video (H.264) Mp3, MP4, and so on…besides it has a 4x digital zoom and the possibility of connecting practically to any device: PCs, DVD readers, iPods and iPhones, digital cameras and mobile phones being able to project images and videos of up to 50”. Its original resolution is 640x480 pixels, but it supports resolutions of up to 1280x800 pixels, and has a size of 125x60x24mm and weights 160grams. It comes with a tripod, incorporated stereo speakers and a great variety of cables of audio and video input.